Here’s some cracking news that has just hit the Gintime desk – Bombay Sapphire has announced that the doors to its long anticipated gin distillery and brand home, Laverstoke Mill in Hampshire, England, will open to the public on 1st October 2014. The mill, which dates back to the 10th century, has been completely renovated by The Bombay Spirits Company Limited, in a multi-million pound restoration to a site covering two hectares of the British countryside astride the crystal clear River Test. For 200 years, Laverstoke produced high quality paper for banknotes for the Bank of England as well as for India and other countries in the British Empire and was historically associated with the finest quality product. Now the newly renovated site provides an opportunity for the public to learn more about the illustrious history of Laverstoke Mill and the unique production processes of Bombay Sapphire gin. Every effort has been made to ensure that Laverstoke Mill is transformed into a state-of-the-art gin distillery and visitor experience, encompassing the highest standards in design, functionality and sustainability. Last year, the distillery was recognised as the first distillery and first refurbishment to achieve an ‘Outstanding’ design-stage BREEAM (Building Research Establishment’s Environmental Assessment Method) accreditation2 for its distillery process buildings. The vision for the site was headed by acclaimed London designer Thomas Heatherwick and his team at Heatherwick Studio, whose ambition for the project focused on restoration of the buildings and grounds, whilst introducing a new structure that complements the natural beauty of the site. 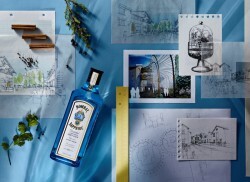 The centerpiece, inspired by Britain’s rich heritage of Victorian glasshouse structures, is the two intertwining Botanical Glasshouses – one tropical, one temperate – specifically designed to showcase examples of the 10 botanicals from around the world used in every bottle of Bombay Sapphire gin. Visitors will have the opportunity to go on their own journey of self-discovery by using interactive maps to explore and learn exactly how Bombay Sapphire is made. Guests will wander through the Botanical Glasshouses and Botanical Dry Room, see the historical Dakin Stills, understand the rich history of Laverstoke Mill in the Heritage Room, and end the experience with a classic Bombay Sapphire cocktail in the beautifully designed Mill Bar.